Ms. Amy Eguia, Resource Person demonstrates proper water application required for hydroponic fodder production at pre-determined intervals and shows the actual grain sprouts at the ATI-ITCPH hydroponics area. 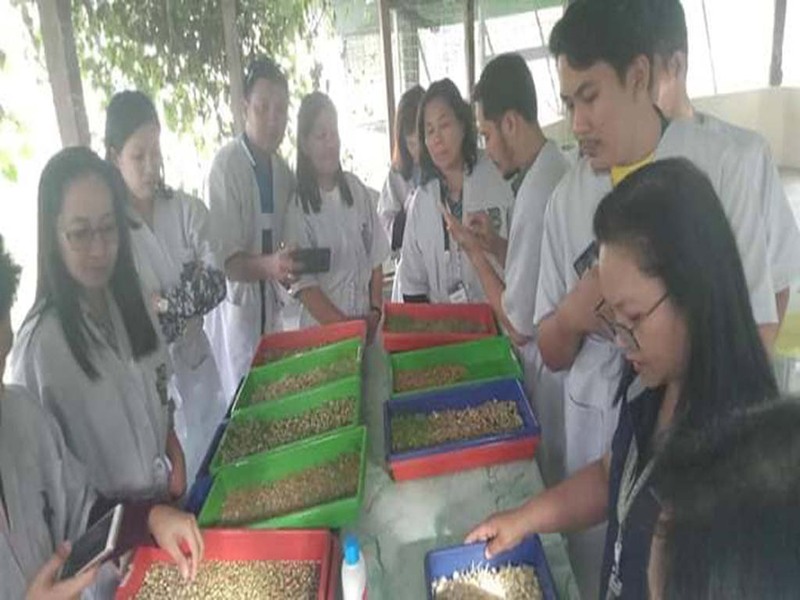 LIPA CITY, Batangas –The Agricultural Training Institute (ATI)-National Livestock program regional focal persons recently completed the Training of Trainors (TOT) on Feednovation: 3Ps of Alternative Feedstuff conducted by the ATI-International Training Center on Pig Husbandry (ATI-ITCPH) on January 28 -February 1, 2019. Among the trainees was Ms. Florita G. Lozada,DMO I/Livestock Focal Person of ATI-RTC 13. The TOT focused on the basic concepts, principles and practices on alternative methods of propagation, production and processing of feedstuff for livestock and poultry. It involved practical lessons on feedstuff identification, and discussions on feed safety and common alternative feeds used by local animal raisers. These include among others madre de agua, gabi, sweet potato, cassava meal, copra meal, and ipil-ipil leaf meal, peas and beans. Participants were exposed to hands-on exercises on Hydroponic Fodder Production. Hydroponic fodder system is a temperature and humidity controlled room that is specifically designed to sprout grains. The hydroponic fodder, a young tender grass grown from grains can then be fed to the animals after seven days. It can be given solely or mixed with concentrates and other feed stuff to reduce feed cost. The trainees also visited the aquaponics demonstration area of ITCPH. Aquaponics is a soilless food production system where fish and plants exist in a symbiotic relationship. Other activities of the TOT included Feed Formulation through Pearson Square Method, Feed Safety and presentation of re-entry plan per region. These innovations in feed formulation aimed to provide the local animal raisers with suitable alternatives while reducing feed costs (with reports from FGLozada).